This past spring, the YMCA of Delaware, the Charter School of New Castle and New Castle County joined forces to announce the launch of an innovative partnership to provide enrichment activities and learning opportunities for 150 youth starting this summer. The $2 million aggregate grant is the largest programming grant received in the history of New Castle County. The partnership established a year-round program including a full day summer session and after-school programming during the academic year. During the summer, 150 elementary and middle school students from the Charter School of New Castle will have the opportunity to enjoy a 7-week full day program structured to help combat summer learning loss. Math and language arts instruction, STEM education, reading and literacy support and character development programming will be offered at the Route 9 Library and Innovation Center. 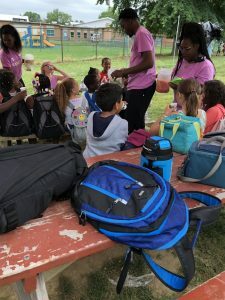 Additionally, students will participate in recreational and character development activities at the Bear-Glasgow and Western YMCA summer day camps.